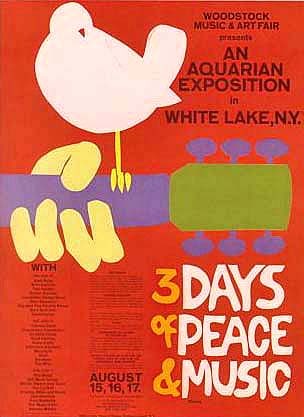 As we mind the drop, we might recall that it was on this date in 1969 that “An Aquarian Exposition: 3 Days of Peace & Music” opened in the Catskills in New York State. The organizers of the Woodstock Music and Art Fair– or Woodstock, as it is remembered– had hoped to sell 50,000 tickets; but by the week before the event, had moved 186,000. A last-minute change of venue presented them with a hard choice: hastily erect more/stronger fences and install additional security on the new site (the now-famous Yasgur’s Farm) or offer the event for free. The night before the event, with attendees already arriving in huge numbers, the promoters cut the fence. Ultimately an estimated 400,000 people enjoyed a (somewhat rainy) weekend of performances from 32 acts. It was, as Rolling Stone opined, a defining moment in Rock and Roll… and one at which scores and scores of trips were taken.